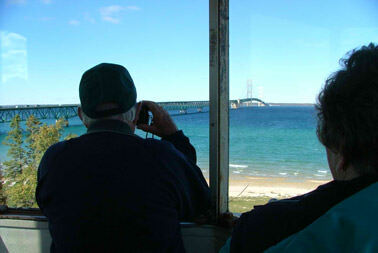 The lighthouse enthusiast, the history buff and the traveler desiring scenic vistas will regard this day as their favorite of your Northern Michigan tour! 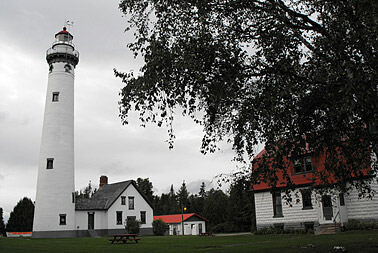 This day trip along the Lake Huron shoreline includes up close looks at big ships, big lighthouses, smaller lighthouses, somber memorials and lore of the region that has 370 years of maritime history. 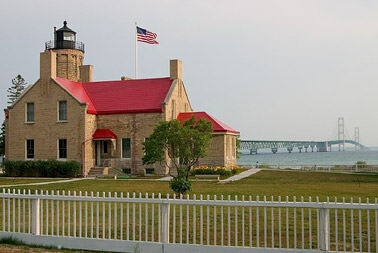 The day begins with a choice of seeing either McGulpin Point Lighthouse* or Old Mackinac Point Lighthouse* (one or the other may have already been visited on our Mackinaw City Tour). From there it’s on to Cheboygan, where your guests will have an observation tour of the Cheboygan Crib Light and Range lights. You’ll see both lights up close on the Cheboygan River. The U.S. Coast Guard cutter Mackinaw may be in port and can be seen and interpreted by our guide. 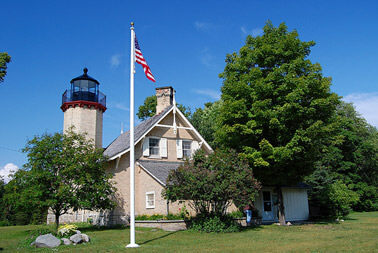 A 45-minute drive next takes us along the scenic Lake Huron shoreline to 40-Mile Point Lighthouse*, where we’ll also see the pilothouse of the steamer Calcite on display. It’s only 15 minutes away to Rogers City’s Memorial Park, where memorials honor the sailors lost on the freighters Cedarville and Bradley. The tragedies greatly impacted this maritime town by claiming the lives of fathers, sons, brothers and uncles. Shipwreck artifacts and storytelling at this site. After a delightful lunch at the Lighthouse Inn*, we’ll step two doors down to the Great Lakes Lore Museum* and see the ship’s bell from the Bradley and the impressive displays of captains, ships and Great Lakes memorabilia. Our Rogers City stay concludes with a stop at the Calcite Dock, where giant freighters may be loading stone next to the motorcoach for a variety of uses. We’ll see examples of their cargo and view the vast quarry that produces materials for America’s road building needs. 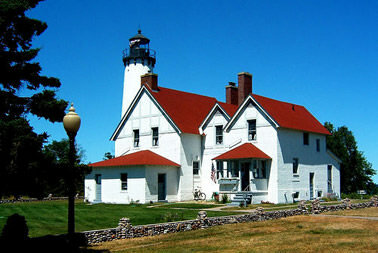 The Presque Isle Lighthouse* is 15 minutes away and boasts the tallest light structure in our area. Like the other lights on our tour, a lighthouse-oriented gift shop offers unusual items sure to please shoppers wanting distinctive gifts. Visiting lighthouses does not have to be a physically demanding day. The tour allows passengers to choose which lighthouse towers (if any) they want to climb. Some are easily accessible but others have enough steps to challenge the fitness buffs in your group. The day’s itinerary has built-in rest periods aboard the motorcoach, at lunch and while viewing ships at the Calcite dock. Some passengers may choose to simply enjoy a walk along the beach or take calendar-quality photos while others insist on seeing the view from the top. We’ll be back at your hotel with an hour to freshen up for dinner. *Separate admission charge for these attractions.